Personal summary : "Painting the land is the best way I know of evoking half forgotten memories or truths. I have long been drawn to places of trauma, be it abandoned post industrial sites,or war zones. My feelings about the physical reality of what is left moves me to paint. I am in a sense a history painter". "Phil's art incorporates big events and issues, their awful consequences and our responsibilities for them. His work raises tough questions about what we humans have done, what we have failed to do, what we have looked away from, who we really are, what we should be. This is rare and powerful art which penetrates and can leave its mark on us". "His work engages with landscape as both a physical place as well as a psychological space.... These works excavate ideas of history and geography, place and time", Phil Nichol, Bayart, 2008. "Phil Whiting is a painter. 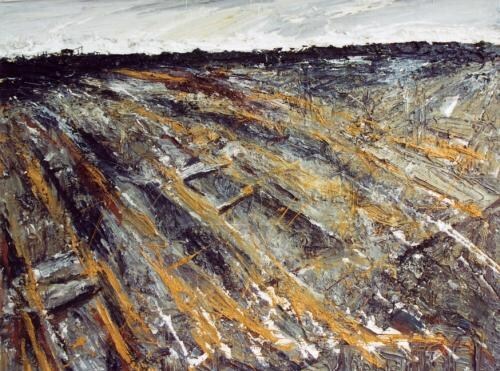 His vigorous use of materials- acrylics (in thick striated impasto) inks, charcoal (ground and smeared) applied with brush, knife and 'whatever'- recalls a terrain smarting from the brute force of man's misuse of it. This is not the celebrated picturesque Cornwall we so often see but its dirty, rain-soaked underbelly, a landscape left bereft by voracious mining and haphazard industrial development. 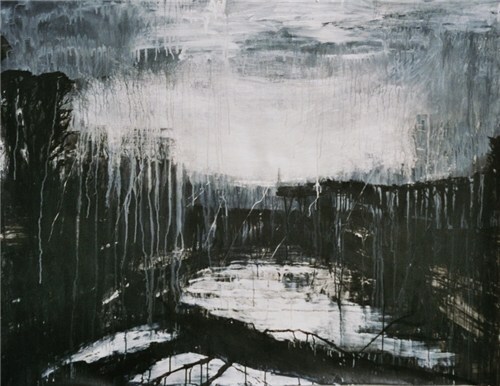 Work from Bosnia (his exhibition 'Srebrenica' transfers from the European Parliament Building to the Royal Cornwall Museum in the Spring) is also included - landscapes whose brutal past is etched into their future reminding us of the horrors mankind is capable of creating for itself", Pip Palmer, Galleries magazine, Jan. 2007. "Predominately black and white, they're built up with thin layers of watery paint that Whiting has splashed, dripped and poured onto the paper using expressive, gestural marks verging on abstraction. Up close, these large paintings are a confusing jumble, as if looking through a mud-spattered window. It's only when you step back, viewing from a distance, that their full power is appreciated. One of the most arresting is 'The Place of Sorrow'. Though the location is not disclosed, its sweeping panoramic view and dramatic sky is incredibly striking. 'Destroyed Muslim Houses Near Srebrenica' is another powerful, psychologically charged work contrasting sharply with the images of Cornwall such as 'Tin Mine Wasteland' or the painting of St Stythians church, its tower just visible in the distance through the drips of paint. Hard-hitting and thought-provoking, this exhibition leaves a lasting impression", David Trigg, Metro, August 2008. "Haunting, brooding and sublime". Frank Ruhrmund, review of Phil Whiting's 'Landscape and Memory' exhibition at the Belgrave Gallery, St Ives Times & Echoe, 2nd March, 2012. 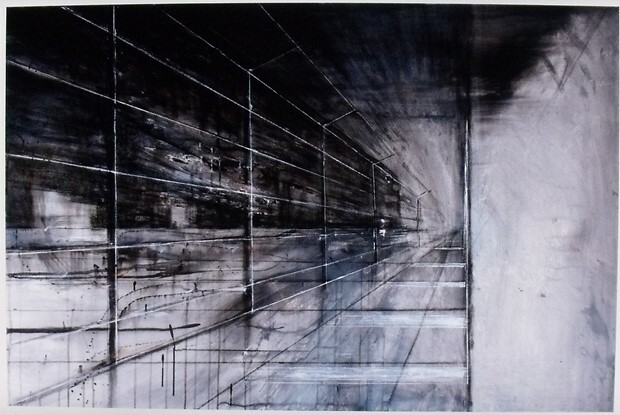 "Phil Whiting has an international reputation for his work based not just on the excellence of its production but also on the uncanny way in which from simple elements of a scene he teases out deeper, darker, emotions that connect with our memories of familiar places and not so familiar events, to render them indelible", Dr Tony Piper, Stuart House Museum, 2009. Influences: Very early on American Abstract Expressionism was important to him. This was enriched by his discovery of David Bomberg and Frank Auerbach (around 1971) and Paul Nash. In the early 80's he also found affinity with German Neo-Expressionism. He reads Modern History avidly and believes that his generation can provide that essential bridge of knowledge/experience between World War 1 and the uncertainties of today. Career path: Born London 1948. Some earliest memories were of bomb sites seen from push chair. Grew up in Hull. Studied Art at Newcastle, Portsmouth and Falmouth Colleges of Art. Hitch hiked across Europe to former Yugoslavia in 1968 showing solidarity with the 'Student Movement' and 'Prague Spring' ("probably my one real achievement whilst a student at Portsmouth College of Art"). In 1974 he worked in a psychiatrical hospital near Leicester where he met aged survivors of the Sleeping Sickness Epidemic' which ravaged the West in the early 1920s. He reallocated to Norfolk and inspired by the area's haunting landscape embarked on his career as a landscape painter. In 1977 he met aid workers working for a Human Rights organisation in Palestine and felt deeply uneasy by the approach of Western powers which seemed little more than adopting the policies of immediate political expediency. Received a supportive letter from Naom Chomsky (with whom he would later profoundly disagree). In 1980 he travelled the length of the former Yugoslavia just after Tito died in Spring 1980 : "People extremely apprehensive about the future." Later he trekked alone in SW Crete following the Allies evacuation route of 1941 to Paleokhora. In 1981 he travelled around America visiting 19 States and crossed the border into Mexico. Deeply impressed by the absence of any real sense of excavated memory or history especially in the deserts of the S.W. he returned to England determined more than ever to become a history painter in the landscape tradition. He moved to London and in 1985 a girl friend and her 6 year old twin boys were callously gunned down. This traumatic experience made him well qualified to explore such areas as the aftermath and pity of conflict and war - issues that later began to inform much of his work. He reallocated to Cornwall in 1989 and embarked on a series of paintings inspired by Cornwalls post-industrial past. In April 1995 at the height of the Bosnian war and whilst Co-director of a painting school in S.W. France he visited Oradour-sur-Glane with students. So moved with what he saw and disturbed by the genocidal behaviour once again taking place in the heart of Europe he made plans for a major project to visit sites of C20th (and later sadly C21st) trauma throughout Europe and the Middle East (later to include New York) in an attempt to find answers. His Project became known as 'Places of Mourning in the Western World' and continues to obsess him to this day. In 1996 he was elected a member of the Newlyn Society of Artists, becoming acting chairman in 2006. In 2004 his oil painting 'Flanders Field' was chosen as her favourite by visiting Arts Minister Estelle Morris (exhibition 'Critics Choice' at Newlyn Gallery). The exhibition was recommended in 'The Times' by Rachel Campbell-Johnston. In 2005 he was commissioned to accompany the N.G.O. 'The Fund for Refugees in Slovenia' to Bosnia to bear witness to the aftermath of genocide as a war artist. This culminated in his solo exhibition 'Srebrenica.Paintings from the Grave' held in the European Parliament Building, Brussels in 2006. Since then he has been invited to give talks and exhibit his work at many institutions including Truro Cathedral and Oxford University, and has been commissioned by organisations such as The Guardian and Amnesty International. In 2017 he became a Fellow of the Royal Society of Arts. Phil is an active supporter of 'The People's Vote' campaign, a passionate advocate for the Western Parliamentary Tradition of Democracy, the Rule of Law, and International Human Rights. "Haunting paintings", Lee Trewhela, Editor Arts and Leisure,West Briton Newspapers. "Here, I feel, is an artist who takes as a start important historical subjects and events and transmutes and transforms them, in his personal way, into poetical and magnificent paintings", Roman Halter, artist and Holocaust survivor. 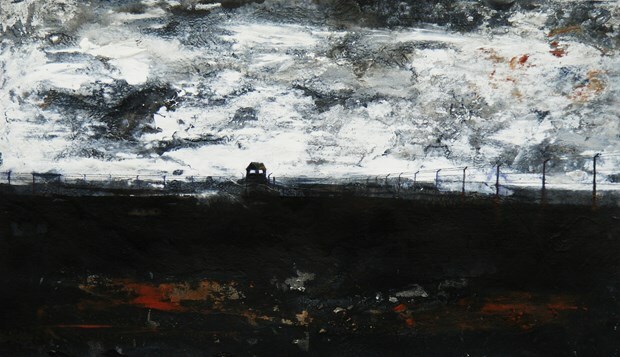 "Sombre but necessary paintings - testimony of an immutable recent history", Professor Paul Gough,UWE,Bristol. 2017 - 'Paintings From the Edge'. The Corridor Gallery, John Radcliffe Hospital, Oxford. 2015 - 'Children Beneath a Different Sky, and other paintings'. Leigh Day Human Rights Law Firm, Farringdon, London. 2014 - 'Opening the Gates of Hell'. Recent paintings with text to help commemorate the Great War Centenary and it's relationship with conflicts today.Truro Cathedral, Cornwall. 2013 - 'The Cornwall Paintings and Places of Mourning in the Western World'. Sir Terry Frost Gallery and the John Moore Theatre Gallery, King's School, Worcester. 2012 - 'Landscape and Memory'. Belgrave Gallery, St Ives . 2012 - 'Places of Mourning in the Western World'. Truro Cathedral, Truro. 2009 - 'Land, Memory and the Anxiety of Erasure'. Stuart House Museum, Liskeard. 2009 - 'Remembrance - Places of Mourning in the Western World'. New College Antechapel, University of Oxford. 2009 - 'Cornwall in Winter', Rainyday Gallery, Penzance. 2008 - 'Philip Whiting Paintings'. The Bayart Gallery, Cardiff. 2008 - 'Srebrenica'. Royal Cornwall Museum, Truro. 2008 - 'Srebrenica and Remembrance'. Truro Cathedral, Truro. 2007 - 'Land and Memory'. Rainyday Gallery, Penzance, Cornwall. 2006 - 'Srebrenica, Paintings from the Grave'. European Parliament Building, Brussels, The Yehudi Menuhin Space. 2005 - 'Phil Whiting Cornwall Paintings'. Campden Gallery (Nov), Chipping Camden, Gloucestershire. 2005 - 'Places of Darkness and Light'. Rainyday Gallery, Penzance. 2003 - 'Landscape, Seascape and Memory'. Counthouse Workshop, National Trust Gallery, Botallack, Cornwall. 1999 - 'The Last Ten Years'. The Counthouse Workshop National Trust Gallery, Botallack, Cornwall. 2019 - 'The Spectre of the Real Exhibition Selection'. SEAS Brighton. 2018 - '10/Ten Abstact Figurative'. Belgrave Gallery, St Ives, Cornwall (catalogue available). 2017 - 'Heart of Conflict'. Royal Cornwall Museum, Truro. 2015 - 'Two Painters'. Sarah Wiseman Gallery, Oxford. 2007 to 2018 gallery artist's group shows, Belgrave Gallery St Ives @ London. 2013 - 'Glasbury Arts Festival 10th Anniversary Visual Art Exhibition'. Cyfarthfa Castle Museum and Art Gallery, Merthyr Tydfil, (invited artist). 2011- 'Truro School Art Collection Exhibition'. The Royal Cornwall Museum, Truro. 2010 - 'Echoes and Traces - exhibition', Musgrove Park Hospital, Taunton. 2009 - 'Out of Cornwall'. The Royal West of England Acadamy Galleries, Bristol. 2008 - 'Paintings by Phil Whiting and Introducing Oliver Whiting' . The Rainyday Gallery, Penzance. 2007 - 'Art Now Cornwall'. Goldfish Contemporary Fine Art, Penzance, Cornwall. 2007 - 'Babes Big Barn Dance'. Chelsea Hospital Gardens, London. 2007 - 'St Ives 1975-2005 Art Colony in Transition'. Book Launch Exhibition of Selected Artists. Belgrave Gallery, St Ives. 2006 - 'Unquiet Earth'. St Ives Society of Artists Gallery, Norway Square, St Ives, Cornwall. 2006 - 'Industrial Cornwall'. The Royal Cornwall Museum, Truro. 2006 - 'Critic's Choice' - selected by Nicholas Usherwood, The Campden Gallery. 2005/6 - 'NSA Selected Exhibition'. Goldfish Contemporary Fine Art, Penzance, Cornwall. 2005 - 'Critics Choice' - Selected by Professor Norbert Lynton, Lemon Street Gallery, Truro. 2005 - 'NSA Selected Exhibition'. Thompsons City Gallery, Central London (highlighted artist). 2004 - 'Critics Choice' - selected John Russell Taylor, Newlyn Gallery, Penzance. 2004 - 'Summer Exhibition'. Campden Gallery, Chipping Campden. 2004 - 'Voicing Dissent (against the Invasion of Iraq)'. Falmouth Arts Centre, Falmouth. 2003 - 'Critics Choice' - selected by Joan Bakewell, Newlyn Gallery, Newlyn. (reviewed in The Guardian). 2003 - 'Two Landscape Painters'. The Rainyday Gallery, Penzance. 2002 - 'Two Painters explore Western Approaches'. Cable and Wireless Museum, Porthcurno, Cornwall. 2002 - 'Weather Forecast Land/Sea and Light'. Newlyn Gallery. 1999 - 'Critics Choice' - selected by William Packer, Newlyn Gallery. 1999 - 'In the path of the shadow'. Geevor Mine, Pendeen. 1998 - 'N.S.A. Choice'. The Royal West of England Academy Galleries, Bristol. 1997 - 'Critics Choice' - selected by David Lee, Newlyn Gallery, Newlyn. 1994 - 'In a different light'. The Royal Cornwall Museum, Truro. (reviewed on Kaleidoscope, Radio 4). 1994 - 'Responces to Landscape'. Beatrice Royal Gallery, Eastleigh. (reviewed by David Lee in Art Review). 1993 - 'Places of Earth and Water'. Rainy Day Gallery, Penzance, Cornwall. 2011 - 'Amnesty International 50th Anniversary Cornwall Schools Art Exhibition'.Targeting Year 10 pupils many from disadvantaged communities. Truro Cathedral. 2007 - 'Unquiet Earth'. St Ives Society of Artist's Gallery, St Ives, Cornwall. 2003 - 'Invitations' (with artist Sue Boafo), Newlyn Art Gallery, Newlyn, Cornwall. 2018 - 'Unreasonable Behaviour - Stories from a Landscape Painter'. Parish Hall, Iffley, Oxford. 2018 - Living Stones Project. Art workshop. One of three invited artists. St Mary's Church, Iffley, Oxford. 2015 - 'Places of Mourning in the Western World', (in conjunction with Freedom From Torture) Iffley Academy, Oxford. 2015 - 'Truth, Reconciliation and Justice'. Leigh Day Human Rights Law Firm, Farringdon, London. 2013 - 'Places of Mourning in the Western World'. King's School Assembly, Worcester. 2013 - 'Places of Mourning in the Western World'. The Sir Terry Frost Gallery, The King's School, Worcester. 2012 - 'Landscape and Memory'. Belgrave St Ives Gallery, St Ives, Cornwall. 2012 - 'Places of Mourning in the Western World'. Truro Cathedral, Truro, Cornwall. 2011 - 'Places of Mourning in the Western World'. Talks organised by Amnesty International South West. Given at Redruth School, Penrice Community College, Penwith School, Humphrey Davy School, Richard Lander School, Tretheras School, Penair School. 2011 - 'Amnesty International 50th Anniversary Cornwall Schools Art Exhibition Address'. Truro Cathedral. 2010 - Dvd and talk 'Places of Mourning in the Western World'. Kings School, Worcester. Phil Whiting's studio, Cornwall. 2010 - 'Gateways to the Heart of Darkness'. Monmouth School, Monmouth, Wales. 2009 - 'Conversations on Land, Memory and the Anxiety of Erasure'. Stuart House Museum, Liskeard. 2009 - 'Places of Mourning in the Western World'. The Contemporary Art Society For Wales., Cardiff University. 2008 - A Leap of Imagination, The Royal Cornwall Museum, Truro. 2008 - Srebrenica-a Reading, Truro Cathdral, Truro. 2008 - The Anxiety of Erasure., The Bayart Gallery, Cardiff. 2006 - The Importance of Srebrenica, The European Parliament, Brussels, The Yehudi Menuhin Space. 2002 - 'Weather Forecast', Newlyn Art Gallery, Newlyn, Cornwall. 2013 - Places of Mourning in the Western World, The King's School, Worcester. 2012 - Srebrenica Revisited, The Fund for Refugees in Slovenia, Srebrenica, Bosnia. 2009 - 'Remembrance, Places of Mourning in the Western World' exhibition, New College, The University of Oxford. 2006 - 'Srebrenica Paintings from the Grave' exhibition',The European Parliament, Brussels. 2005 - To bear witness to the aftermath of genocide as a war artist, The Fund for Refugees in Slovenia, Srebrenica, Bosnia. 2003 - 'Landscape.Seascape and Memory' exhibition, The Counthouse Workshop National Trust Gallery., Botallack, Cornwall. 2006 - Painting 'Par Docks, Cornwall' (plus later purchase of two other paintings in 2012) The collection of the Chancellor of the Exchequer The Rt Hon George Osborne MP, London. 2005 - Large drawing 'Crows on Snow at Geevor' plus the purchase of two other paintings. The Collection of Minister of State for The Foreign Office and former Shadow Culture Secretary The Rt Hon. Hugo Swire M.P. (plus work purchased for over 200 private collections at home and abroad). 2016 - Painting 'Old Mine Workings'. The collection of the Penlee House Museum & Art Gallery. 2009 - Painting 'A Minions Elegy'. The collection of The Stuart House Museum. Cornwall. 2008 - Painting 'The Place of the Missing no.2'. The collection of the Royal Cornwall Museum. 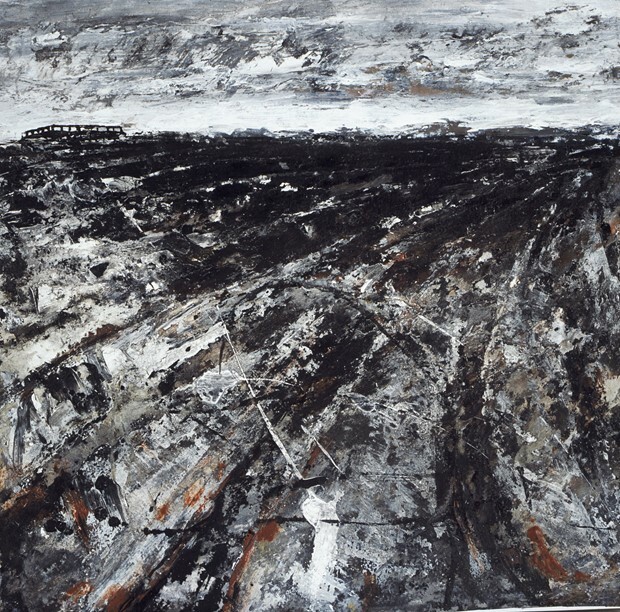 1994 - Painting 'Geevor Tin Mine 2'. The collection of The Royal Cornwall Museum. 2009 - Painting 'Watch Tower'. The Collection of New College, University of Oxford (see Bridgeman Art Library). 2009 - Painting 'Shoah'. The collection of Haberdashers Monmouth School for Boys. The chapel vestry wall. 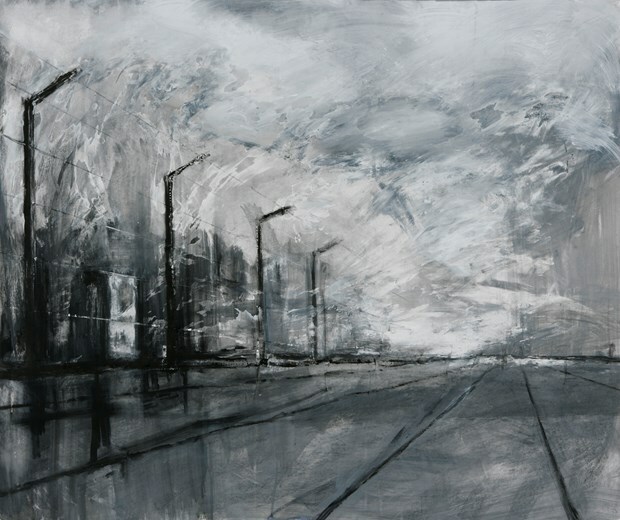 2008 - The Painting 'Place of the Missing no.1'. The collection of Truro Cathedral. 2007 - Painting 'Sithney Church. Late October' . The collection of Haberdashers Monmouth School for Boys, Monmouth, Wales. 2005 - Further corporate purchases include 2 paintings purchased by Thompson's Galleries Ltd London, and 1 painting purchased through auction by the Belgrave Gallery St Ives in 2013. 2005 - Painting "Grade Church from Goonhilly Downs". The collection of Truro School. 2019 - American Musician Ross Grenier. 2006 - The Office of Neil Parish MEP. European Parliament. 2013 - 'Miloska'. A film by Slovenian film maker Rudi Uran about the extraordinary life of Lady Miloska Nott which includes appearances and paintings by Phil Whiting. Shown and discussed on Slovenian National Television. Kramberger & Uran, Maribor, Slovenia. 2011 - 'Srebrenica. A Cry from the Grave'. Music by John Guy Storer and paintings by Phil Whiting. Produced by Engineers of the Imagination. You Tube. 2017 - Winner for Individual Piece of Art : Annual Awards for Art about Big Global Issues or Concerns - Redline Art Works. 1981 - Financial Award to help fund practice : Arts Council EAA. 2012 - The 20/21 International Art Fair, Royal College of Art, London. 2010, 11, 12 etc - 'Light a Candle for Hope'. Holocaust Memorial Day. Painting 'The Place of the Missing' exhibited. Truro Cathedral, Cornwall. 2009 - Formal presentation of painting 'Watch Tower' to New College, University of Oxford. 2007 - Auction of Painting 'Winter Afternoon, Penwith', 'Babes Big Barn Dance' - in Aid of Childrens Hospice South West'.Painting sold for £22000.0 - £2200.0 going to the artist. Royal Hospital Gardens, Chelsea. 2018 : "10/Ten Abstract Figurative". Published by Belgrave St Ives, St Ives. 2018 : "Artists Never Retire - Couple Travel Twelve Thousand Miles Overland Through History", Liren Tan, The Chinese Weekly, video posted on TCW social platform 24/25th Jan 146k views. * "12,000 miles by public transport......", Kat Orman, BBC Radio Oxford, December 6, 2017. * "12,000 miles overland from Oxford to Hong Kong", BBC South Today, December 2, 2017. BBC South Today Face Book 104k views. * "Couple travel 12,000 miles to Hong Kong using only commuter style transport", Adrian Chiles, BBC Radio 5 live, 28th November 2017. * "Couple travel from Oxford to Hong....." by Helen Coffey, The Independant, November 27, 2017. * "Nothing sketchy about 12,000-mile journey...all using public transport" by Georgina Campbell, Oxford Mail, November 22, 2017. * "12,000-mile trip to Hong Kong is sketched out" by Georgina Cambell, The Oxford Times, November 23, 2017. * "Couple travel to Asia using only public transport", I.T.V .Meridian News, 6pm November 24th, 2017. 2015 - Book : Oxford University Vol.1 The Colleges. Oil Paintings in Public Collections. 2015 - A Journey into the Wilds of Our Minds, Anne James, Oxford Times, 22nd Jan.
2014 - Opening the Gates of Hell Exhibition by Phil Whiting. Reviewed by Simon Parker, Western Morning News, 4th August 2014. 2014 - Phil Whiting's Opening the Gates of Hell Exhibition, West Briton, 31st July 2014. 2014 - Phil Whiting's Opening the Gates of Hell WW1 Exhibition, Truro Cathedral Newsletter, August and September 2014. 2014 - Third Light. A Play to Honour the Herodsfoot Heroes, by Simon Parker Souvenir Programme with images by Phil Whiting, Sterts Theatre, 2014. 2013 - Book : The Lost Boys, Victoria Field, Waterloo Press, 2013. 2012 - A Whiting Double. Cornwall Today magazine, Jan. 2012. 2012,14,16 - Book: Who's Who in Art, 35th,36th,37th editions, Morven Press. 2012 - Bosnian War inspires exhibition, Western Morning News. 2012 - Landscape and Memory Exhibition Catalogue with foreword by Peter Davies, Belgrave Gallery St Ives. 2012 - Landscape and Memory : 'haunting, brooding and sublime' at Belgrave St Ives. Frank Ruhrmund, The St Ives Times & Echo. 2012 - 'Places of Mourning in the Western World' exhibition.Truro Cathedral Newsletter. 2012 - Political painter who keeps alive the memory of the horrors of war. The Cornishman, March 1st 2012. 2012 - 'Srebrenica (after a painting by Phil Whiting).' Poem by Victoria Field, Orbis Quarterly International Literary Journal. 2012 - Phil Whiting and his work, sermon by Cannon Philip Lambert, Truro Cathedral. 2012 - Srebrenica Revisited, by Phil Whiting, The Western Morning News. 2012 - Srebrenica Revisited, by Phil Whiting, Truro Cathedral News Letter. 2012 - Amnesty International (UK) Section Report 2012. 2011 - Amnesty International 50th Commemoration Cornwall Schools Art Exhibition Programme. Truro Cathedral. 2011 - 'Students Inspired By Professional Artist' - The West Briton. 2010 - BOOK: 'Called by Mind and Spirit;Crossing the Borderlands of Childhood' - by Gavin Knight and Joanna Knight. 2010 - Mental Health Hospital Chaplains' news letter (using the painting 'Shoah' as the "pivotal focus between mental health and spiritual development". Gavin and Jo Knight). 2009 - 'A Minions Elegy' painting featured in Western Morning News. 2009 - 'A Minions Elegy' reproduced in the play by Simon Parker 'Gonamena' Souvenir Programme.Sterts Theatre. Cornwall. 2009 - 'Deeper Meanings.' Artists&Illustrators magazine. 2009 - 'Father and Son Reunion at the Rainyday' by Frank Ruhrmund,The Cornishman. 2009 - 'Remembrance'. An article with images written by Phil Whiting and published in the Truro Cathedral Newsletter. 2009 - Truro Cathedral Annual Review 2008. 2008 - Artist's Work Reflects Man's Inhumanity to Man.' Simon Parker, The Western Morning News. 2008 - Cornwall Heartlands Project Brochure (oil painting reproduced for front cover). 2008 - 'Cornwall in Winter.' Frank Ruhrmund, The St Ives Times & Echo. 2008 - 'Philip Whiting at Bayart.' Buzz Magazine. 2008 - 'Srebrenica. An Exhibition of War Paintings by Phil Whiting.' Cannon Philip Lambert, foreword in exhibition catalogue. 2008 - Trigg's review of Whiting show in Metro : 4 stars. 2007 - 'Artist Phil Whiting Recalls a Year.' Cornwall Today Magazine, Jan.
2007 - BOOK : Cornwall and the Isle of Scilly. Oil Paintings in Public Collections. 2007 - BOOK : St Ives 1975-2005 Art Colony in Transition.' By Peter Davies. 2007 - 'Cook and Whiting.' Pip Palmer-Galleries Magazine. 2007 - Phil Whiting Recent Paintings. 'Cornwall Life Magazine'. 2006 - Srebrenica.Paintings from the Grave exhibition catalogue. Forewords Prof.Paul Gough,Roman Halter,Hugo Swire MP. 2006 - 'The Woman's Block.' The Guardian, 20th Sept. 2006. 2005 - 'Bosnia Suffers in Silence.' Maurice Stevens, The Cornishman. 2002 - BOOK:'ARTSNA.' Newlyn Society of Artists. 2001 - BOOK:'Images of Cornish Tin.' Alan Stoyel & Peter Williams, English Heritage. 2000 - 'Mining heritage inspires artist.' The West Briton. 2000 - 'Phil Paints Penwith Mines with Singular Fashion' Simon McNulty, Cornwall Arts magazine. 1999 - Paintings by Phil Whiting : The Last Ten Years by Frank Ruhrmund, The Cornishman. 1994 - Responses to Landscape Exhibition, Beatrice Royal Gallery, David Lee, Art Review. 1969 - DipAD,Portsmouth College of Art. 1974- ATD,Cert Ed, Leicester University. 1987- Advanced Printmaking Course, Sir John Cass Art School, London. 2002- PGDip. (Fine Art), University College Falmouth. 2016- To research further material for 'Places of Mourning in the Western World' project completed a short course titled ''Terrorism in the Contemporary World' at Dept.For Continuing Education, Oxford University. 2019 - Commissioned by American musician Ross Grenier to paint the cover image for his forthcoming album 'Nightfall'. 2018 - 'Exploring the Landcape - Where Geology and Art Meet'. A talk given by Francis Howie which among other art works includes Phil Whiting's painting 'Geevor Mine. Winter 1991 No2'. Penlee Museum and Art Gallery, Penzance,19th February. 2017 - Axisweb Catagory of the Week : Activism (22nd August to 29th August) Painting 'Cold River Palestinian Refugee Camp, Lebanon' chosen by guest selectorTheresa Easton to be featured. 2017 - elected a Fellow of The Royal Society of Arts. 2017 - Blog : www.royalcornwallmuseum.org.uk 'Place of the Missing' by Phil Whiting. 2016 - elected Hon Treasurer FOSM. 2016 - Red Line Art Works Gallery Page. 2016 - 52Watch, April edition : Books, Axisweb. 2016 - 'A Magpie Looks at Velasquez, Picasso, and an Icon or Two'. A talk given by Philip Lambert which incudes two paintings on the terrible events of Sarajevo and the Srebrenica genocide in 1995 by Phil Whiting. Wed Jan 20 at 11am. Kalamitu Arts Group, Raki Bar, Vamos, Chania, Greece. 2008 - Srebrenica and Remembrance, BBC Radio Cornwall, Truro. 2008 - Phil Whiting's 'Srebrenica' exhibition at the RCM, Peter Davies, Dialogue, Axisweb. 2007 - Srebrenica Exhibition Interview, BBC Radio Cornwall, Artists Studio. 2006 - acting chairman of The Newlyn Society of Artists,The Newlyn Art Gallery,Cornwall. 2005 - elected member of The Newlyn Art Gallery and Exchange Gallery Council of Management. 2006 - Srebrenica Paintings from the Grave exhibition interview, European Parliament Radio Links/BBC Radio Cornwall, The Yehudi Menuhin Space, European Parliament Building, Brussels. Phil Whiting is married and has four grown up children and six grandsons.